This recipe's spicy-sweet flavor is a perfect combination with the full-flavored duck. Great for summer barbeque. - Combine all glaze ingredients in heavy saucepan. Bring to boil, then immediately reduce heat to low. - Cover and let simmer until cherries and chilies become tender, about 15-20 minutes. - Put simmered mixture into blender to puree. Return to sauce pan and continue on low heat until sauce thickens into a glaze. - Taste glaze for amount of chile heat desired. For less spicy glaze, add extra ground cloves. - Preheat oven to 325º. - Prick duck leg skin in several places. Season liberally with salt and pepper. - Spray oven-safe pan with cooking spray and place duck legs in pan, skin-side up. Bake for one hour at 325º. - Baste duck legs with glaze and finish on gril on in broiler for 5 minutes for crispier skin. 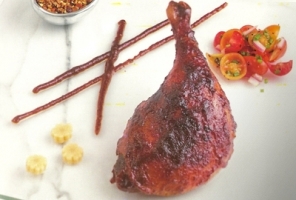 Serve duck legs with extra glaze for dipping.